Yesterday Alicia and I cruised our way over to Narragansett, Rhode Island. I picked her up in my 03 Ford Focus around 9:30; the car’s a champ, it eats so many curbs & just carries along. The ride was fine, not too many nervracking turns or reckless steering wheel DJ moves. We hit no traffic either way & construction wasn’t anything to huff about. Narragansett is a great town. I had the opportunity to live there last summer, right on Boston Neck Road, and let me tell you- it was a blast. Being in the land of Del’s Shandy’s, Narragansett Beer, and earthy-surfers was not a bad life. I was able to work, party and relax by the beach (and Brickley’s, an amazing ice cream place that outdoes most local places). The people are very laid back & welcoming. I feel as if most people there do not believe in time, they’re so leisure and worry-free. A shocking habit that Rhodey’s have is that they leave their cars running when they go into stores quick. Not locking cars & houses is something I’m unfamiliar with but Gansett’s townspeople are carefree and trustworthy (the town itself also has a very low crime rate). Most of the people in RI that I’ve met gave off a sea-passionate vibe & made me feel at ease. They’re my type of people & I made some good friends out of the deal. Our trip yesterday was fun and relaxing. The water was warm, the sun was shinin, and the waves were roaring. Swimming in the lukewarm ocean was a pleasant treat to me for I don’t have a pool at home anymore. Before we set up shop on the sand, we went for brunch. Lee and I ate at Crazy Burger Café & Juice Bar Restaurant on Boon Street. Boon is walking distance from the beach and offers a few gift shops. The line for Crazy Burger was shorter than I expected; we waited outside for “Erica, Party of Two” for about twenty minutes. The longest I’ve ever waited was 35 minutes during dinner hours. The place is usually mobbed with people because it’s so damn good (and because seating is tight). Crazy Burger is really on the map. People from all over Rhode Island come to dine here… Hell, we drove two hours to be seated in its quirky dining room. Crazy Burger is bigger than us though! Guy Fieiri from Diner, Drive-INs and Dives gave the restaurant some air time. Guy RAVED about how well they nail their take on classic diner food. He also emphasized how great their fatty flavorful burgers are (all 31!). Since my friend Max worked at Crazy Burger, I’ve had exposure to lots of different things on its large menu. Whenever he would close he’d bring extra kitchen food to our house- ya can’t be mad at that. With that said, I still had some trouble narrowing down what I wanted to eat yesterday. I knew to go with breakfast food, for 11:30AM is still too early for me to think about lunch foods. 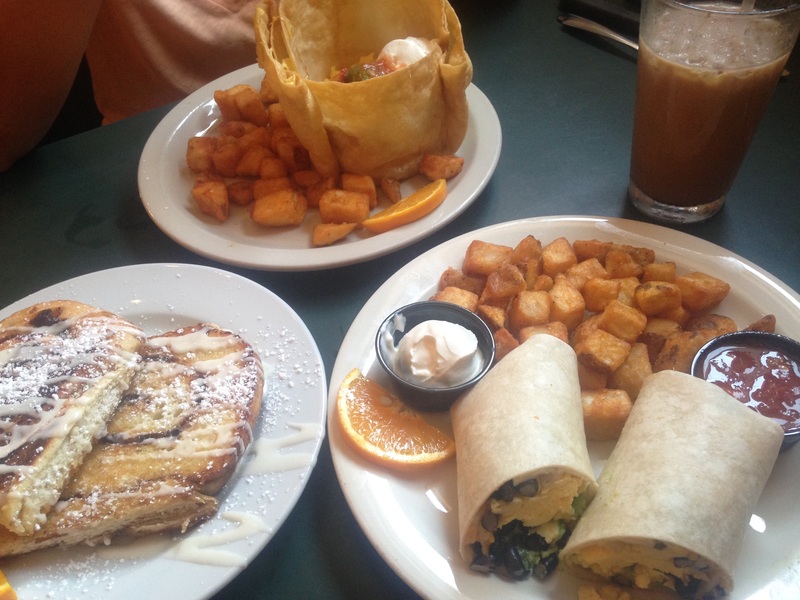 Both of our dishes, thankfully, came with some of the best home fries I’ve had in a while. You’d think that would be enough food though, right? Wrong, we saw a plate of homemade cinnamon rolls walk by our table so we had to order them too. An iced spice chai tea accompanied all this deliciousness and it even came with a homemade gingersnap fudge cookie! Safe to say this meal was the only thing I ate all day. Once again, Crazy Burger was ridiculously good & filling; Alicia was pleased with my pick for breakfast locations. Mews Tavern- CLASSIC, everything tastes great, do not leave without a few drinks! Trio- nicely cooked steaks & long wine lists, plus Kelsey used to work there and they were good to her. No matter what you do or where you eat, I bet you’ll have an amazing day in Narragansett. It’s truly one of my favorite places to go and relax. On a conclusive note, Gansett has it all; you can shop, surf, eat, drink and be merry. It must have been a great experience! I always dreamt of visiting this place for some strange reason. Wow! It sounds like you have a life full of great friends, food and travels. Thank you for transporting me out of the midwest, if only for a few moments. What an enjoyable read! That’s awesome to hear- I’m glad you liked it! I travel around, read some others posts, maybe they’ll illustrate something enjoyable and new for you too! I’ll take a look at your posts as well Whitney. Yay! Narragansett is my home town, so this was a cool post for me to see in my blog feed today! Looks like a wonderfully relaxing trip! I have yet to travel to anywhere in New England, but RI is def on the list! RI is so fun in the summer, take a trip next year! Where are you from? You should read some of my other posts, I travel all around, see if you’ve been any of the same places!